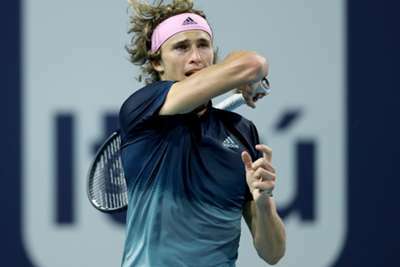 Alexander Zverev was stunned by David Ferrer at the Miami Open as Marin Cilic and Stan Wawrinka also made second-round exits on Saturday. Ferrer turned back the clock in a huge upset, edging last year's runner-up Zverev in three sets at the ATP 1000 event. Cilic and Wawrinka were also beaten on a day when seven of the 16 seeds in action were eliminated. Roger Federer only narrowly avoided being one of them, while Stefanos Tsitsipas also progressed to the third round. Ferrer, 36, will retire this year, but the Spanish veteran and 2013 runner-up was in impressive form in stunning second seed Zverev 2-6 7-5 6-3. It was Ferrer's first win over a top-three player since 2014 and ended his four-match losing run against Zverev. Awaiting him in the third round is Frances Tiafoe, who edged past Miomir Kecmanovic 7-6 (8-6) 7-6 (7-5). It was a day of upsets in the men's draw as grand slam champions Cilic and Wawrinka exited in contrasting fashion. Cilic, the ninth seed, went down to qualifier Andrey Rublev 6-4 6-4, continuing what has been a poor start to the year for the Croatian. Cilic holds a 4-4 win-loss record in 2019. Wawrinka was eliminated by Filip Krajinovic, who battled to a 5-7 6-2 7-6 (7-5) victory over the Swiss 30th seed. "One of the points of the tournament so far." Steve Johnson, Karen Khachanov, Diego Schwartzman and Guido Pella were the other seeds to fall. A three-time champion in Miami, Federer survived a huge test from one of this year's form players in Radu Albot. The Swiss 20-time grand slam winner edged past the Moldovan 4-6 7-5 6-3 after a huge battle. See you in R3, @rogerfederer! Tsitsipas, the eighth seed, also advanced after beating lucky loser Mackenzie McDonald 7-6 (7-4) 6-1. Kevin Anderson, Grigor Dimitrov, Daniil Medvedev, Denis Shapovalov, Marco Cecchinato and David Goffin also progressed.